Do you want to make sharing on Pinterest private? This can be easily done by creating secret boards which can be only accessed by specific Pinterest users. All pins in secret boards are completely private and only visible to allowed members. This is a great way to create your secret sharing community on Pinterest website. 1. 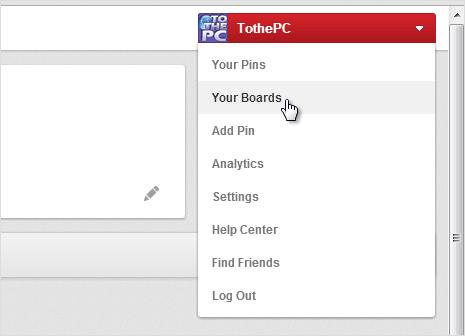 Once you login into your Pinterest account, hover over your profile name at top right and then click on Your Boards option. Then click ‘Create a Board’ button to get started. 2. In the pop-up window, type the name and description of your new Pinterest board. Also select relevant category from options in the drop down box. 3. To make a board private, select Yes next to Secret option. Click Save Changes button to finally create your private board. Now goto ‘Edit’ mode of the secret board to invite friends to share in this private board. Just type name or email to send invitation. Note: you can make any private board public by selecting No next to Secret option. But once board has been made public, you cannot revert it back to private mode. Also, you cannot make existing public boards private. 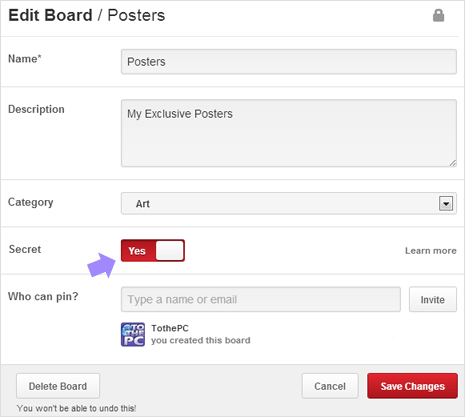 So be careful while toggling between Yes and No for Secret setting of boards on Pinterest.